Can something possibly be, at one and the same time, both a discrete particle (Werner Heisenberg) and a continuous wave (Erwin Schrödinger)? This mystery at the heart of quantum mechanics was seen first by Albert Einstein in his 1905 paper (for which he won the Nobel Prize) proposing his "light-quantum hypothesis." On the modern quantum view, what spreads out is a wave of probability amplitude, the possibilities for absorbing a whole photon somewhere. Einstein's view since 1905 was that light quanta are emitted in particular directions. There are no outgoing spherical waves (except probability amplitude waves). Even less likely are incoming spherical waves. Einstein in 1916 had just derived his A and B coefficients describing the absorption, spontaneous emission, and (his newly predicted) stimulated emission of radiation. In two papers, "Emission and Absorption of Radiation in Quantum Theory," and "On the Quantum Theory of Radiation," he derived the Planck law (for Planck it was mostly a guess at the formula), he derived Planck's postulate E = hν, and he derived Bohr's second postulate Em - En = hν. 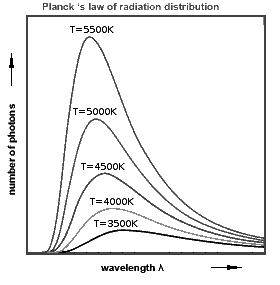 Einstein did this by exploiting the obvious relationship between the Maxwell-Boltzmann distribution of gas particle velocities and the distribution of radiation in Planck's law. Eight years later, in his paper on the A and B coefficients (transition probabilities) for the emission and absorption of radiation, Einstein carried through his attempt to understand the Planck law. He confirmed that light behaves sometimes like waves, at other times like the particles of a gas.